The overall structure of POnTE project can be broken down into the following 11 work packages (WPs). In each WP the target pathosystems will be tailored for the different aspects of their biology, genetics, ecology and epidemiology, using common advances approaches. WP1 Aetiology of emerging disease affecting relevant crops and forestry. Elucidate the role of known and/or new characterized pests and harmful organisms associated with emerging diseases affecting relevant crops and forests. WP2 Biology and pathogenesis. Gain knowledge about the virulence, the pathogenicity and the host range of the target pathogens. WP3 Genotyping and genetic structure of pathogen populations. Development of genetic information on the new emerging pathogens and definition of the genetic structure of the pathogen populations. WP4 Implementation and validation of diagnostics for early and rapid detection of target pathogens in host plants and vectors. Development of accurate and rapid diagnostic assays for the innovation and implementation of the procedures adopted for the survey and surveillance programs. Development of strain-specific serological and molecular markers for pathogen population monitoring. WP6 Field and automated surveillance system for vector and disease monitoring. Exploit surveillance strategies for effective monitoring programs, i.e. testing and validating remote sensing approaches for early detection and identification of areas with potentially infected sites to be prioritized for lab testing and subsequent containment and eradication actions. WP7 Signaling pathway, molecules and genes contributing to pest resistance in field. Gain knowledge on potential resistance mechanisms studying interactions among signalling pathways involved in plant defence responses, identifying genes and molecules for potential applications for protection against pests as well as beneficial micro-organisms for an effective biocontrol. WP8 Plant disease risk assessment and support for Plant Health decision making. To develop new quantitative tools for risk assessment of invasive species detrimental to plant health, including economic evaluation of risk mitigation options, and assessment of climate and other global change influences on pest risk. 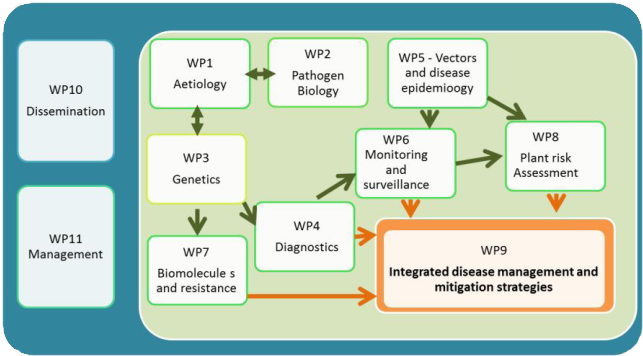 WP9 Integrated disease management and mitigation strategies. To design and to assay managing, environmentally friendly and innovative, mitigation strategies based on epidemiological data and on three pillars: seed treatments, reduction or elimination of vector population, and cultural or innovative IPM practices. WP10 Dissemination of technical and scientific results and demonstrative trials. The main objective of this work package is to promote the project internal and external visibility in order to raise an awareness and provide adequate advice. WP11 Management of the consortium. The project management ambitions is to guarantee the correct implementation of the activities, the achievement of the project objectives and expected results.